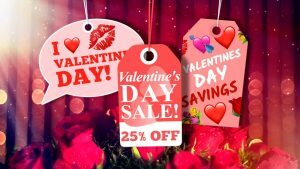 Overshoot Text is a set of 3 simple, yet deceptively powerful text effects for FCP X. Animate multi or single line text with customizable, horizontal, vertical, or scale overshoots. So simple yet so useful. Everyone should have this in their FCP X toolkit. Some parameters are unique to the scale, horizontal, or vertical plugins/presets and are noted as such in parenthesis. The scale of the entire effect as a whole. The scale of the overshoot. The number of times it overshoots past the final location of the text. Animate by line, word, character, or all text at once. Animate by line, word, character, or all text at once in a variety of combinations. The scale plugin is unique in that it contains two parameters. The first parameter determines what element is going to be scaled (line, word, character or all). And the second determines the grouping, which is also line, word, character or all. For example, “word by word” animates each word individually, a word at a time. But “word by line” animates each word individually, but a whole line of words at a time. Selections marked 3D scale from a singular “shoot” point based on the entire composition. Right to Left or Left to Right starting direction of the animation. Up or Down starting direction of the animation. The point that scale plugin elements (line, word, character or all) scale from. Reverse from scaling up to scaling down. The maximum number of elements (lines, words, or characters) animating at any given time. 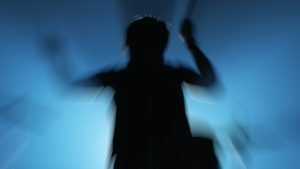 The opacity at the start of the effect. 100 essentially disables any fade in at all. 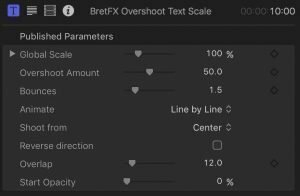 Thanks for downloading the BretFX Overshoot Text set of plugins! I hope you enjoy them and find them useful in your productions. If these instructions don’t cover all questions about installation and usage, don’t hesitate to contact support@bretfx.com. 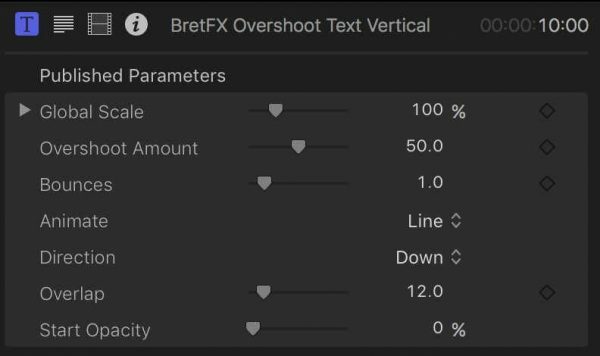 BRETFX OVERSHOOT TEXT consists of 3 plugins and 65 presets to animate your single or multi-line text with horizontal, vertical or scale overshoots. You can animate by line, word, character, or all at once. Overshoot Text Horizontal overshoots text from left to right or right to left. Overshoot Text Scale overshoots text with a scaling effect. You control what direction the text scales from including center, top center, left center, right center, baseline, etc. 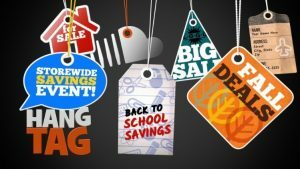 Overshoot Text Vertical overshoots text in an upwards or downwards direction. Double click the downloaded DMG file to mount the installer and agree to the license. Double click on the .pkg installer and follow the prompts. 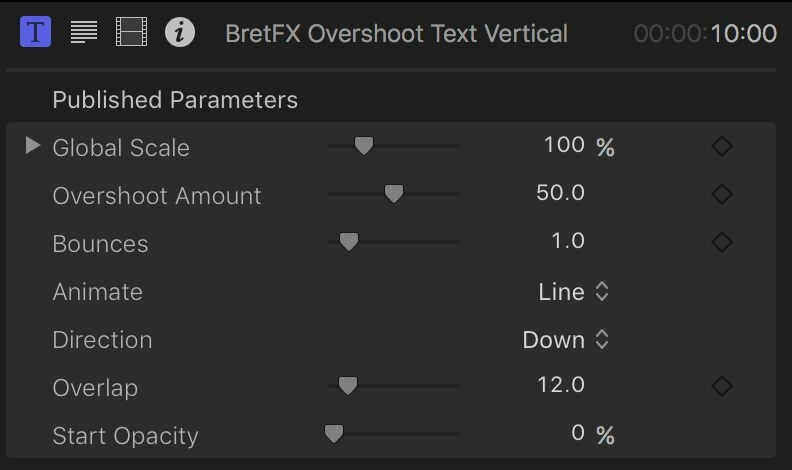 The Overshoot Text plugins will appear in the titles browser in FCP X under BretFX Overshoot Text. In FCP X, navigate to the titles browser and find BretFX Overshoot Text. 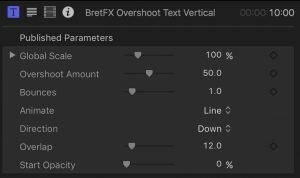 Drag one of the 3 BretFX Overshoot Text Custom plugins or one of the 65 presets to the timeline. 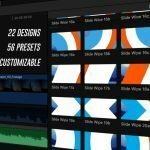 All presets have the same controls and capabilities of their respective custom Overshoot Text plugin. Either double click the text in the viewer, or navigate to the text pane in the inspector and edit the text like any other FCP X text. With your Overshoot Text title selected in the timeline, open the inspector (if it isn’t already) and navigate to the title pane to reveal the parameters described below. Some settings are unique to the scale, horizontal, or vertical plugins/presets and are noted as such in parenthesis. Controls the scale of the entire effect as a whole. To control the position the preferred method is to simply click on the text in the viewer (don’t double click) and drag the entire text group to it’s desired position. You can position with the transform tools, but the effect could potentially animate off the edge of the effect boundaries and appear clipped in the viewer. Controls the scale of the overshoot. A smaller number starts the animation closer to the final location of the text and overshoots past the final location of the text a smaller amount than a larger number which starts farther away and passes the final location by a larger amount. Determines the number of bounces, defined as the number of times it overshoots back and forth past the final location of the text. Choose if you want to animate by line, word, character, or all text at once. Choose if you want to animate by line, word, character, or all text at once in a variety of combinations. 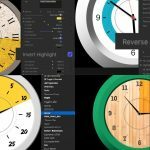 The scale plugin is unique in that each animate selection contains two parameters. The first parameter determines what element is going to be scaled (line, word, character or all). And the second determines the grouping, which is also line, word, character or all. For example, “word by word” animates each word individually, a word at a time. But “word by line” animates each word individually, but a whole line of words at a time. In other words, the grouping (line) of words would all scale up individually from their own individual scale points, but they would all scale at the same time, followed by the next line of words. Selections marked 3D scale from a singular shoot point (set in “shoot from” parameter discussed later) based on the entire composition instead of each element. It’s best to play with the different settings to understand their simple, yet powerfully unique differences. Choose from Right to Left or Left to Right to control the starting direction of the animation. Choose from Up or Down to control the starting direction of the animation. Determines the point that scale plugin elements (line, word, character or all) scale from. For example if you’ve chosen to animate “Word by Word” and shoot from “Top Center” then each word will scale up from a point at the top center of each word. However, if you choose an animate choice marked 3D like “Word by Word 3D” the shoot point will be from the top center of the entire composition, creating a faux 3D look with the impression of z space and depth. Check this box to reverse the animation from scaling up to scaling down. Controls the maximum number of elements (lines, words, or characters) animating at any given time. A setting of 1 means that the second line word or character won’t begin animating until the first is finished animating. A larger number allows that number of elements to be animating at the same time. The perceived speed and duration of the overall animation is largely controlled by the overlap number. 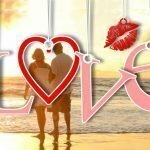 Long texts being animated by a single character at a time or with a low overlap number may have undesired results and it is suggested they be broken up into multiple text plugins for best results. By default each text element (line, word, or character) fades in as it animates on for a smooth effect. The start opacity slider controls the opacity at the start of the effect. Setting it to 100 essentially disables any fade in at all. Fantastic effect. Simple to use and works perfectly. Thanks Diana! Glad you’re enjoying it! This has become a staple of my YouTube series. Simple and allows a good balance between having some eye-catching movement, but not something silly.